Sustainable Objection? Bruce Bartlett is one planning commissioner threatening to dig in his heels against "smart growth" scenarios if he doesn't get more specifics from planning staff. 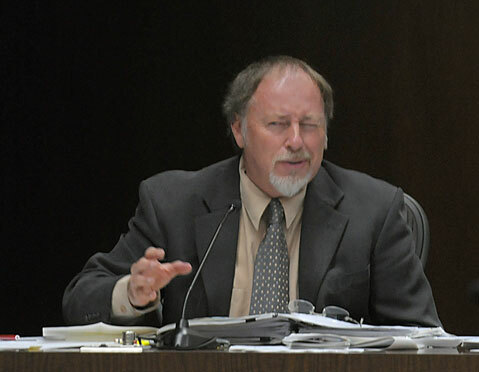 At the end of an eight-hour meeting on the City of Santa Barbara’s general plan update in which the Planning Commission commented on a staff report titled “Draft Policy Preferences,” commission member Bruce Bartlett spotted a snafu. The commission had been poised to pass the draft, with its suggested amendments, to the City Council, which will ultimately designate a scenario to guide the city’s development for the next two decades. The show-stopping anomaly appeared on a table of “growth scenario assumptions” presenting the five alternative scenarios to be subjected to environmental analysis. What Bartlett noticed was that all of the options had one thing in common: The proportion of new residential units to new commercial development was about the same as now. The high-growth option called for as many as 7,000 new residential units, plus three million square feet of new commercial or other nonresidential development. The low-growth alternative would add just 2,000 new residences, and staff’s recommendation would add 2,800, but none of them appeared to do anything about the jobs-to-housing imbalance everybody has been talking about, the high percentage of commuters, the shortage of housing for workers. Bartlett objected strenuously, and the rest of the planning commissioners concurred that the numbers should be rebalanced, especially in light of the fact that many of the policies they had been poring over aimed to create more room for the city’s workers. This was one precept that all sides agreed upon during months of Plan Santa Barbara community workshops. Planners said they could see the commissioners’ point. Project Planner and EIR Analyst Barbara Shelton, however, said planners disagreed on what those revised numbers should be. The staff and commissioners decided to continue their discussion on September 25. With time to reflect on the numbers, City Planner Betty Weiss told the commissioners, “I think you’ll see it for its relative importance.” She suggested that the type of units that will dominate the city landscape-fewer large condos, more small affordable units-might be better worth focusing on rather than the number of units. Commissioners also expressed frustration about the scarcity of maps associated with the general plan draft, contrasting it to the Outer State Street study completed last year, which had great maps. “Land use includes primarily density: How much of what kind goes where?” asked Commissioner John Jostes. Bartlett and other commissioners who regard higher-density scenarios with extreme wariness could still cause trouble by holding things up at the Planning Commission level if they don’t get the specificity they seek. Raising the ante is the fact that a group of citizens have managed to gather enough signatures to qualify for the November 2009 ballot a charter amendment that would confine new buildings to a maximum of 45 feet-less in some places, including 40 feet downtown. The city’s ordinance committee is even now writing a rival ordinance that will need to assuage the fears of the slow-growthers and earn their buy-in. Policies were for the most part conceptual rather than specific. For example, the document calls for the city to “establish the number of acres of parks or open space per increment of population (e.g. 5,000 residents)” rather than doing so itself. Community Development Director Paul Casey indicated that those details will be fleshed out in the Environmental Impact Report. The commissioners seemed generally satisfied with the guidance the staff report would provide for energy and water conservation and alternative transit. And they agreed that neighborhoods surrounding downtown State Street, Milpas, and San Andres should receive most future growth, though there was some dissent over whether the Mesa should be included as well. The growth region was dubbed the Mobility Oriented Development Area. Additionally, Commissioner Addison Thompson asked staff to add a provision for reinvestigating the relocation of the Metropolitan Transit Center to the Amtrak station, to make better connection between trains and buses.